Baby, it’s colddddddddd, outside! If I had to pick my least favorite season it would most certainly be winter. I like snow, but when it’s not on the ground, I like cold air when I’m in the burning heat, and I like being layered up when it looks cute! All of the things winter requires I never truly love, but I will same there are some winter trendy coats that I’ve been feeling this season! Keep reading to see the must-have coats this winter! Let’s start with the one that I hated as a kid because mine were always overwhelmingly huge one me. 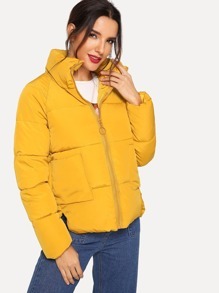 We’ve seen the puffer coat trend make a huge entrance this fall/winter season! In bold colors such as blue, red, pink and more! What I most about this trend is how this coat is comfy, and an instant eye-catcher! Everyone needs a statement coat in their closet. Whether that statement is printed or color-blocked, it’s a must have for me! This doesn’t have to be an everyday coat, actually I find that wearing statement coats daily takes the unfff out of them! It just has to be a coat that you whip out when you’re ready to make a….statement, haha! Futuristic was never my style, but when it comes to these coats that’s the only vibe I get and I adore it! I wore this coat in NYC in the rain and didn’t have to worry about it one bit. The raindrops just swiftly glided off and onto the ground. Practical & Fashionable—two words I live by! What’s your favorite coat trend this year? Do you have any of these must-haves in your closet? Talk to me in the comments below!